British historian James Barr published a book in 2011 about the rivalry between Britain and France for control of the Middle East after World War I, entitling it A Line in the Sand. 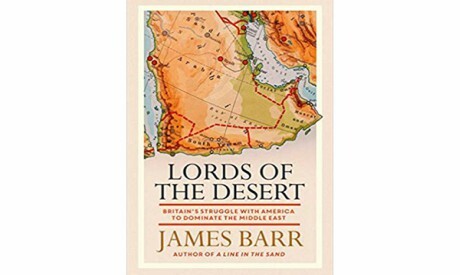 He has now followed this up with another book, Lords of the Desert, about the rivalry between Britain and the United States for control of the same region after World War II. While the first book described a struggle in which the main participants held similar hands, and in which both were forced to compromise, the second describes a more asymmetrical situation in which the rivalry was between a rapidly declining empire and a rapidly rising one. It was a contest whose outcome was never seriously in doubt. However, the British retreat and the American advance across the region in the decades after World War II was not necessarily entirely decided in advance. While the post-World War I period saw the carving up of the former Ottoman Empire into a system of nation-states whose components were mostly under British or French control, the period after World War II was characterised by attempts to stabilise or reinforce the existing system in the interests of larger international alliances. The US sought to woo some states, and the former Soviet Union sought to entangle others, within the framework of the developing Cold War. Rivalry within the system led to drawn-out proxy wars, perhaps the most tragic of which took place in Yemen. Newly assertive states emerging from British or French colonial control, in some cases flush with oil, made bids for regional leadership. The tragedy of Palestine saw the British firmly ejected from one part of the post-war Middle East and the Americans drawn ever more firmly into it. All in all, while the post-World War II period saw less of the redrawing of international frontiers that had marked the period after World War I, the replacement of British and French influence in the Middle East by that of the Americans and the Russians, more or less complete a decade or so after the war had ended, was perhaps no less dramatic. It may not make for as neat a story as the one Barr tells in A Line in the Sand, in which European diplomats like the Englishman Mark Sykes and the Frenchman François Georges-Picot met to decide the shape of the post-War Middle East armed with little more than a set of maps and a propensity for bargaining, but the legacies of some of its major episodes probably still rankle as much or even more than the earlier ones do today. They include not only the declaration of the state of Israel in what had been Palestine in 1948, the Anglo-American plan to overthrow Iranian prime minister Mohamed Mossadegh in 1953, and the Tripartite Aggression (the Suez Crisis) by Britain, France and Israel against Egypt in 1956, but also British attempts, in this case with US support, to construct a system of alliances around Turkey, Iraq and Iran, the so-called Baghdad Pact, and later to hang on to British positions in the Gulf and Yemen. They start even before the war had ended with a speech that the then British prime minister Winston Churchill made in London in November 1942 after the Battle of Al-Alamein in Egypt, the first major British land victory in the wider war. “We have not entered this war for profit or expansion,” Churchill said, but “let me, however, make this clear: we mean to hold our own. I have not become the king’s first minister in order to preside over the liquidation of the British Empire,” whether in the Middle East or elsewhere. Often thought to have been directed at then US president Franklin D Roosevelt, Churchill’s words threw down the gauntlet to the United States, whose war aims even at this comparatively early stage in the American involvement in the War included the dissolution of the British Empire and its incorporation into a new world order centred on Washington. That should have been obvious from the words of the 1941 Atlantic Charter, an Anglo-American declaration on the shape of the world that would follow the end of the war, which spoke of self-determination and free trade, neither of which were associated with the British Empire. Unlike in the decades that followed the end of World War I, when the US withdrew into isolationism, this time round the US was determined to stay on in the Middle East and elsewhere, perhaps predominantly because of the region’s enormous reserves of oil. Shoring up British rule could not be part of US plans, whether for commercial reasons, because of the global conflict with the Soviet Union that was already in prospect, or for ideological reasons relating to the dissolution of European colonial rule. Barr’s book looks at episodes from the post-war period that are already well-known, examining them afresh from the perspective of Anglo-American rivalry. The first is the end of British rule in Palestine and the declaration of the state of Israel in 1948, developments in which the US was obliged to play a double or possibly even a triple role. Roosevelt’s promise to support David Ben-Gurion, later the first prime minister of Israel, in his efforts to weaken British rule, necessary, Barr says, to win his US re-election campaign, did not sit easily with his other promise to king Ibn Saud of Saudi Arabia that the US would “never support the Zionists’ fight for Palestine against the Arabs”. This latter promise was necessary in order to secure US oil interests in Saudi Arabia and a new US military base in Dhahran. It was left to Roosevelt’s successor, Harry S Truman, to sort out the confusion, though Truman’s own “insistence that 100,000 Jews be let into Palestine” shortly after the end of the war, despite the risk, according to then British prime minister Clement Attlee, that doing so would “set aflame the entire Middle East” and do “grievous harm” to Anglo-American relations, for a time also seemed calculated to sabotage US relations with Ibn Saud. Truman was obliged to write “a grovelling letter to the king” claiming that he had been misquoted on his views and in his contradiction of Roosevelt’s undertaking. The US played an elusive role in Egypt, making promises, especially on helping to end British colonial control, that it could then be reluctant to cash out. Having given up on prospects of reform under the then Egyptian king Farouk, Roosevelt, Barr writes, “met three representatives of the [Free Officers] movement secretly on Cyprus” that would later remove him. While the then British foreign secretary, Anthony Eden, later wrote that “the coup happened so quickly that no one was aware until the morning before,” the American authorities in Cairo seem to have known what was brewing. “On 13 July,” some 10 days before the coup that turned into the revolution, “by which time Farouk was on his fourth prime minister that year, the assistant air attaché in the US Embassy in Cairo was told that the Free Officers were on the point of making a move,” Barr writes. “By the end of August 1952 British diplomats suspected that the American ambassador, Jefferson Caffery, was encouraging the junta [the Revolutionary Command Council] to keep them at arm’s length.” Later that year, British cabinet minister Harold Macmillan wrote that “now we are treated by the Americans with a mixture of patronising pity and contempt,” perhaps a sign that US support for the conspirators had been designed to end both the monarchy in Egypt and the British influence that had gone with it. Barr’s book draws for the most part on British cabinet and other records, and his natural habitat seems to be the British archives, giving his account an Anglocentric tone. This is an account of the post-war Middle East as seen from London, and it is conspicuously lacking in voices from the region. However, including more such voices would have meant writing a different book to the one that Barr has written, which is a serious, carefully sourced, and thought-provoking account of how one foreign power supplanted another in the decade after the end of World War II in the Middle East region. The author of What Isa ibn Hisham Told Us (Hadith Isa ibn Hisham), Muhammad Al-Muwaylihi, was an Egyptian journalist and man of letters who was particularly active around the turn of the last century when he was associated with the progressive literary and political circles of the time in Cairo and Istanbul. His father, Ibrahim Al-Muwaylihi, was a friend and colleague of religious reformers Gamaleddin Al-Afghani and Mohamed Abdou and acted for a time as tutor to prince Ahmed Fouad, later king Fouad I, during the latter’s Italian exile in Naples. Muhammad Al-Muwaylihi worked with his father on Al-Afghani and Abdou’s opposition newspaper Al-Urwa Al-Wuthqa, and on his return to Cairo in the 1890s became a member of a literary salon meeting at the house of princess Nazli Fadil, a niece of the former khedive Ismail. “This served as a meeting place for a remarkable collection of figures from Egyptian political and intellectual life,” writes Roger Allen in the introduction to his comprehensive translation of Muhammad Al-Muwaylihi’s major work What Isa ibn Hisham Told Us. In addition to important religious and political figures of the time such as Ibrahim Al-Laqqani and Boutros Ghali, grandfather of former UN secretary-general Boutros Boutros-Ghali, the salon hosted writers and politicians such as Qassim Amin, Hafiz Ibrahim, and Saad Zaghloul. Blunt, an intriguing figure who also owned an important stud farm for Arabian horses, was a leading critic of British imperialism and the author of The Secret History of the English Occupation of Egypt, which he intended to reveal the truth about Cromer and British rule. The fact that Muhammad Al-Muwaylihi was apparently on friendly terms with such a wide range of political and literary figures gives his work additional interest even aside from its qualities as a work of literature and an important literary testament of the time. As Allen writes in his introduction to this translation, published in a single paperback volume in 2018 after an earlier Arabic-English edition in NYU’s Library of Arabic Literature series, the book is a fascinating record of the mentality and of many of the political events of the time in which it was written, roughly between 1898 and 1902. However, it is also a particularly challenging one to translate because of the circumstances of its original publication and its multiple later revisions. It consists of a series of articles that originally appeared in Misbah Al-Sharq (Light of the East), a newspaper founded and edited by the Al-Muwaylihis in 1898 and running until 1903. Al-Muwaylihi had earlier published a series of articles on life in Istanbul in the newspaper Al-Muqattam, an early rival of Al-Ahram, drawing on his experiences there in the earlier 1890s. In his new series, published under the running title of Fatrah min Al-Zaman (A Period of Time) from November 1898 onwards, he turned his attention to Egypt, using the device of a visit by a pasha, or aristocrat, from earlier in the century who is shown around late-century Cairo by a narrator, Isa ibn Hisham, himself drawn from a well-known mediaeval work of Arabic literature. The pasha is by turns astonished and scandalised by what he sees, and the device allows Al-Muwaylihi to satirise his own society while also using the pasha’s incomprehension and Isa ibn Hisham’s patient explanations to yield comic dividends. The subjects dealt with are in part related to current events, and there are excurses on the situation in the Sudan, a trip to the Universal Exhibition in Paris in 1900, and “a visit by the Khedive of Egypt to Her Majesty the Queen of England”. This provides opportunities to juxtapose “traditional mores and western fashions… through a number of different venues and situations, including restaurants and food, bars, tourism, money borrowing, and the theatre,” and it is perhaps this aspect of the book that best explains its popularity and lasting importance. For Allen himself, the translation has been something of a lifetime’s work, along with the authoritative Arabic edition of the text from which it has been made. An earlier study and translation of the third edition of the book (1923), also by Allen, appeared in 1974 and 1992, and there was a further edition of the Arabic text that he prepared for the Supreme Council for Culture in Cairo as part of a complete edition of the Al-Muwayhilis’ work that appeared in 2002. However, for the new translation (and Arabic text) Allen decided to go back to the original editions of Misbah Al-Sharq and reproduce all the original articles, even those later rearranged or omitted by Muhammad Al-Muwaylihi as part of subsequent revisions. In an article that appeared on 8 December 1898 Isa ibn Hisham decides to show his new friend the pasha “the things he had not seen, tell him about the things he had not heard, and explain those aspects of modern history which he did not know or that he might find perplexing. The pasha is not impressed with the late 19th-century legal system, seeing in the profusion of “Sharia courts, native courts, mixed courts, disciplinary tribunals, and consular courts,” little more than “utter confusion”. Later still, he is invited to a meeting of Al-Azhar sheikhs, who engage in arcane discussion, followed by a visit to what seems to be a business club, perhaps in the new district of Garden City, where the conversation turns to Western education. “Aren’t these schools and the education they offer responsible for the troubles we’re having with our sons,” one participant asks. The pasha and Isa ibn Hisham return to the subject of visiting Europeans in an entry dated November 1899. “How often have we seen tourists putting up with all the hardships of travel… spending thousands of dirhams and dinars in the process, and all so they can look at some ruins in this part of the world.” This is followed by a visit to the Pyramids and then on 25 May 1900 to the Egyptian Museum.